Triple matured for tripled ex-cite-ment. Laphroaig distillery was founded in 1815 by Donald and Alexander Johnston and is located in Port Ellen, Isle of Islay. Although Laphroaig isn't allowed to put the prefix ‘Royal’ in its name (yet), rumour has it his royal princeness Charles of Wales is a fan of the ‘L’ Whisky. The 15-year-old is reportedly the prince's favourite Scotch. Laphroaig Triple Wood is made in a similar fashion than their famous Quarter Cask. The main difference is that after they age it twice, in Bourbon barrels and then in small 19th century style Quarter Casks, they add a third maturation, in large European oak, Oloroso Sherry casks. This final maturation gives the Triple Wood extra complexity and a slightly sweet edge, making for a significant distinction between the Quarter Cask. Triple Wood is a limited edition, originally supposed for the European Travel Retail only, but luckily for all Laphroaig (and peat) fans, they released a limited amount to the *general* public, too. Thank the Whisky Gods for that (or Laphroaig's marketing department). The Triple Wood has won numerous awards in the past two years, most notably the Gold medal at San Francisco World Spirits Competition. 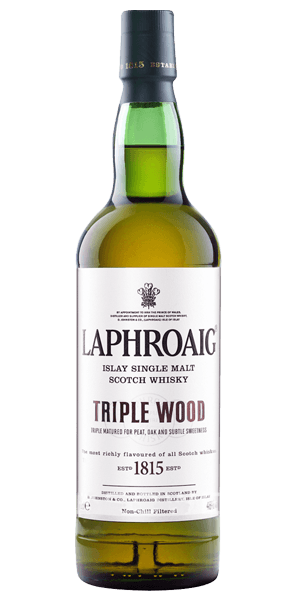 What does Laphroaig Triple Wood taste like? The Flavor Spiral™ shows the most common flavors that you'll taste in Laphroaig Triple Wood and gives you a chance to have a taste of it before actually tasting it. Quite sweet, also marine-like, oyster shells, iodine, light smoke, vanilla and of obviously Sherry. Vanilla, sherry, black pepper, exotic spices, peat reek and citrus fruits. Mouth filling, long and creamy. Very smoky and strong presence of peat. I can see why some people like it because of the strong peat smell. The finish is quite smoky for me, and too long, but not in a nice yummy way... I can't taste anything else. absolutely one of the best scotches I've had, highly recommend if you want some peat, but it's still very smooth with sweet notes at the end. I was ver pleasantly surprised by this bottle. I went to the store saw this and read the profile, decide WTH and wow do I enjoy it. I'm a peat/sweet guy and this nails both. Mild peat taste. I really enjoyed the fruit notes. Finishes well. Quite enjoyable on a cold evening. For someone who generally prefers Ardbeg over Laphroaig this one is a lot more up my alley. Way less "dirty" than the 10. Love the smokiness and full flavor profile! Another great Islay from Laphroaig. Flavorful and smoky! This is scotch at its scotch best. An Islay with a full flavor profile and reasonable price is hard to find. This one combines them all in a Laphroig package. And you get a little piece of Scotland with each bottle! Slainte! Good stuff...full of that smoky goodness! Smooth and peaty. You won't be disappointed with this unique and flavorful taste. Strong pleasant sherry note, with fruit and smoke in the taste. Aftertaste hitting with more smoke and spicyness. Nice wood flavor and one of my favorites. It is Laphroaig. You can definitely get the extra wood flavor from out of this. I love it, but not as much as Laphroaig 10 Cask Strength. That peat burns so good! Good go-to scotch if you like Smokey wood flavor. Great value. All about the flavor. Glad my friends don’t like it as much as I do!! Peaty, with a strong nose of ethanol. Takes some getting used to. Needs a drop or two of water to open up. Delicious and smooth. One of my favorites. You wont go wrong with this one. Being a highland guy this a fantastic Islay for the taste buds. Nice complexity and excellent smoothness and smoke. The sherry is prominent on the nose and lends a calming sweetness to the body overall note quite as smoky or peaty but the sweetness is just subtle enough to make this invitingly delightful. One of my favorites love the wood and peaty notes. Updating my rating after making it through most of the bottle. This drink has really grown on me and more of the complexities revealed themselves. QC plus a little extra-- delicious. Beautifully rich smokiness with slightly more modest peat than a Lagavulin 16. This had a great, smoky taste. Extremely smooth. Sweet finish. If you're looking for a strong peat profile, this isn't for you. Fantastic, smokey and smooth with just enough heat. Great whisky, very light peat & smoke. Good finish with vanilla notes. A little heat on the back of the tongue. My first Islay. Sweet, smokey, long finish. I'd say a good starter to the peat/smoke area.